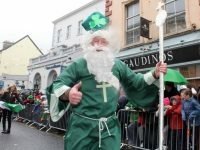 ST Patrick’s Day is only a little more than two weeks away and the deadline for entries for the highlight of the day in Tralee is almost upon us. The organisers are inviting local community groups and organisations, as well as clubs, schools and businesses to take part in the parade which is always a fantastic celebration of the community. The 2018 Parade Theme is Ireland’s Most Enterprising Town and will start at The Rose Hotel roundabout on Dan Spring Road at 11.45am. There will be entertainment in The Square and The Mall after the parade until approximately 2.30pm and we are encouraging all parade participants and their families to stay in town for a fun afternoon in Tralee Town Centre. The route is different this year as it goes from Dan Spring Round to Cloonbeg Terrace, Dean’s Lane, Boherbee to Castle Street, along The Mall and finishing at the entrance to The Square next to Carraig Donn.